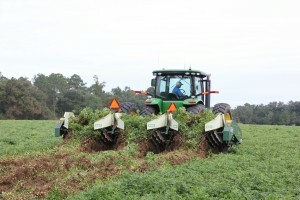 The top peanut-producing state in the country showcased its 2015 crop during the annual Georgia Peanut Tour, which was held Sept. 15-17. The University of Georgia, along with the Georgia Peanut Commission, coordinated the three-day tour, which allowed participants to visit southwest Georgia, home of some of the top peanut producers in the state. The tour, which included farmers, industry personnel and visitors from other countries, educated participants about all aspects of peanut production — from planting and harvesting to the manufacturing of the crop. Tour attendees learned why peanuts are a high-value crop for Georgia farmers. Srinivasan and fellow UGA team members, including plant pathologists, agronomists, entomologists and economists, provided insight as to why peanut production is a complex — but rewarding — process. “Even though we have a number of people who participate in the peanut tour every year, we have several newcomers. What we wanted to do was show to them everything we could in a couple of days about peanut production. This being the time for harvest, we were able to show them how the peanuts are harvested and processed” Srinivasan said. The tour included visits to multiple farming operations in Decatur, Grady, Miller and Seminole counties, including John Harrell’s peanut field in Grady County on Thursday. Srinivasan said Georgia was expected to grow almost 800,000 acres of peanuts this year. Such an increase was attributed to the poor commodity prices for corn and cotton. While peanut prices are not ideal, they do present better opportunities for profit, which is why achieving high yields is so important for farmers in southwest Georgia.